The perils of the automated car wash, with harsh wash chemicals and vigorous brushes, are well known. For anyone passionate about the appearance of their vehicle, these types of car wash are to be avoided at all costs. The wash chemicals are usually highly acidic or highly alkaline to strip dirt, grease and road grime quickly. The synthetic brushes rotate fiercely, causing the ends of the bristles to whip the paintwork, scourging the dirt from the surface. 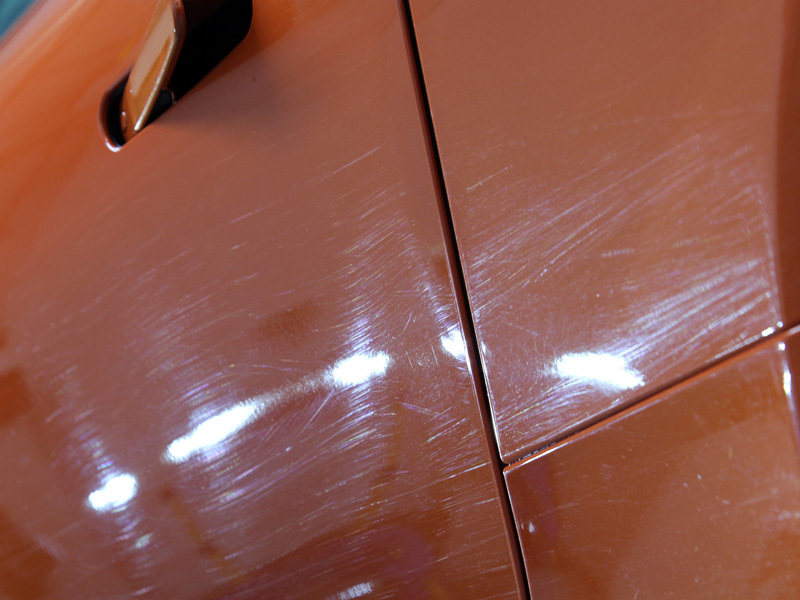 While the result is usually moderately effective at removing dirt, casual inspection of the paintwork after a trip through the car wash often reveals a myriad of swirl covering the surface. 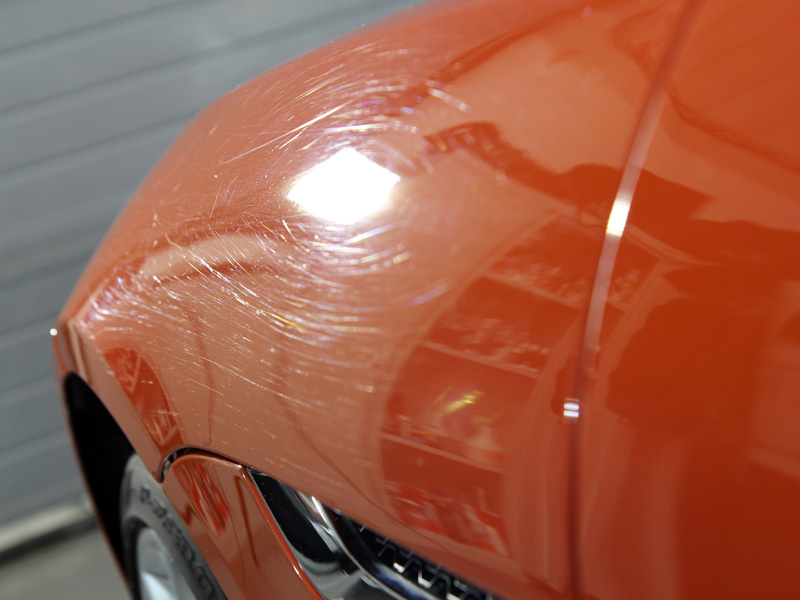 These swirls are scoured into the clear coat and quickly cause the shine and reflectivity to dull, giving the car a tired and lacklustre appearance. At this point, machine polishing is required to restore the appearance. 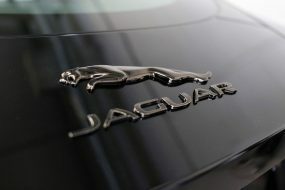 It was a surprise for a recent customer when they discovered their Jaguar dealership had an automated car wash on site for the cleaning of all their vehicles! 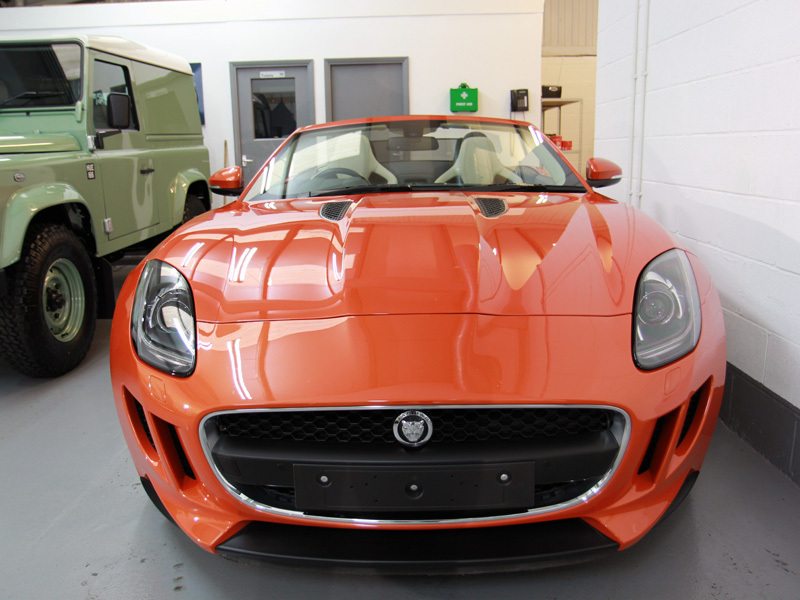 Having returned their Jaguar F-Type for its annual service they unsurprisingly, requested their car not be cleaned at all! Imagine their horror when they discovered their car had unwittingly, been allowed to slip through the net and had been washed anyway! 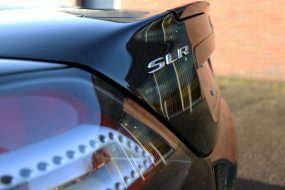 Due to the high level of damage, the car was booked into for Paintwork Correction Treatment, but first the car needed to be decontaminated, pre-cleaned, washed and dried before the paint could be thoroughly assessed. 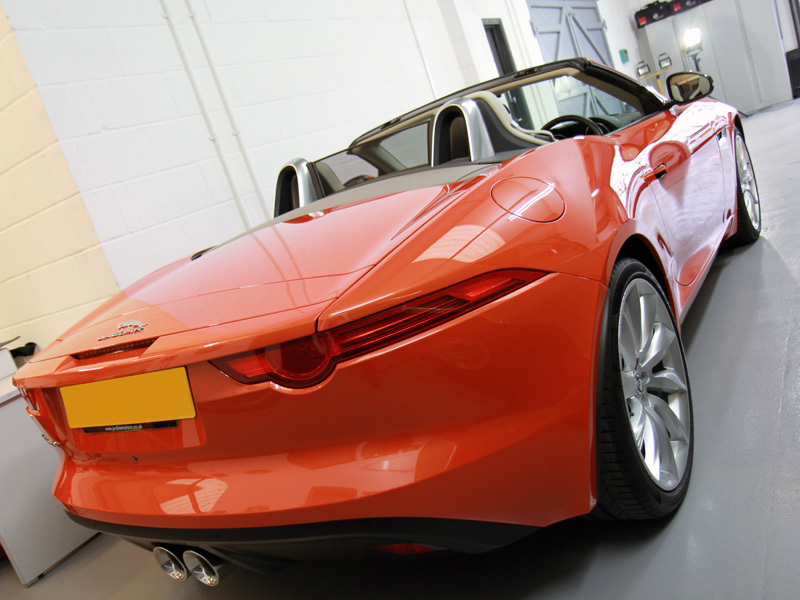 Initially, the wheels and the bodywork of the Jaguar were treated with Nanolex Wheel Cleaner & Iron Remover, a ferrous contamination remover that changes colour on contact with iron particles. These are derived from hot brake pads shredding under load. The particles become airborne and attach to the nearest surface and, as they’re hot, they bond immediately. Regular washing will not remove these particles and so a specialist cleaner is required. Next the paintwork was degreased using Bilt-Hamber Surfex HD, a water-based degreaser that easily removes build-up of oily grime, greasy dirt and diesel splatters. Particular attention was paid to the boot, bonnet and door shuts and catches, as well as the petrol cap, as all these areas are natural traps for this type of contamination. After rinsing, the next step was to pre-clean the vehicle using Ultimate Snow Foam. Applied using a snow foam lance attached to a Kranzle 1152 TST Pressure Washer, the thick foam clings to vertical surfaces easily, lifting larger particles of dirt and grit away from the surface and allowing them to be freely rinsed away. 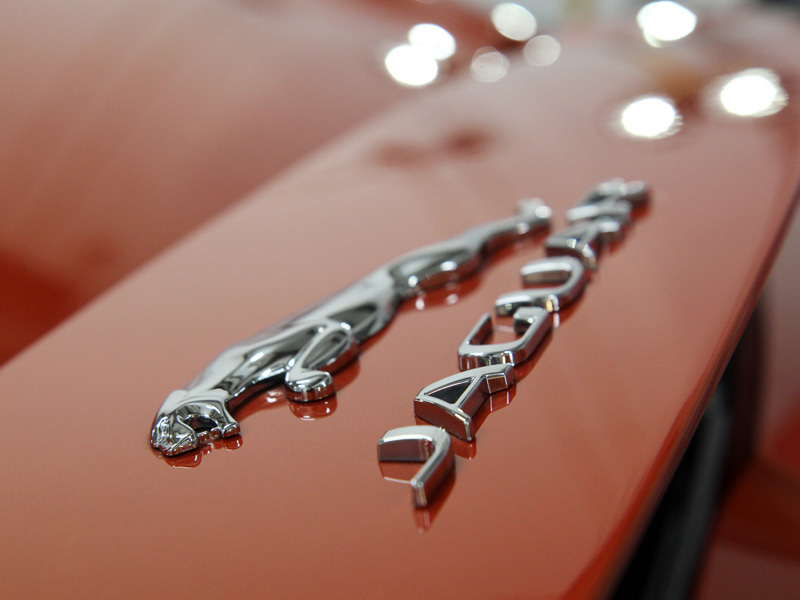 The Jaguar was then washed using the Two Bucket Method, an Ulti-Mitt Double Sided Merino Wool Mitt and Gtechniq G-Wash, a pure shampoo that does not contain gloss enhancers or wax additives. 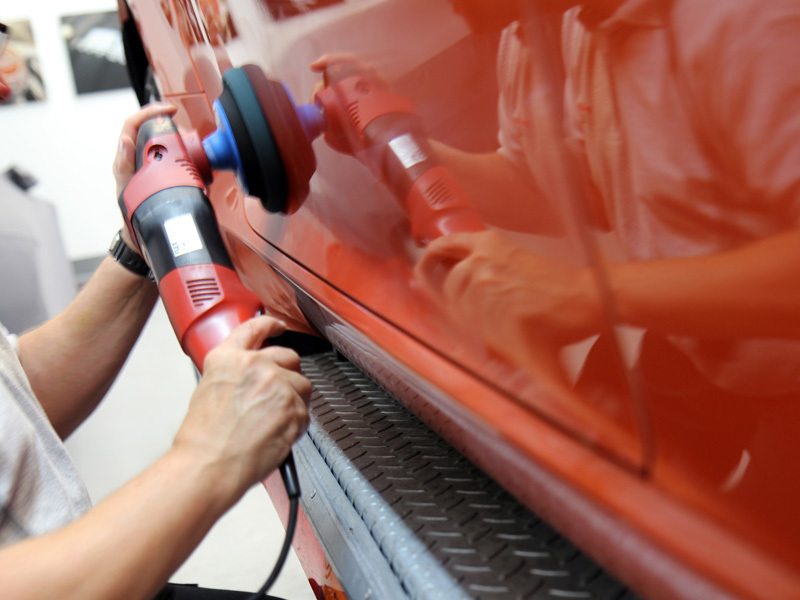 This ensures the car is completely clean, with no elements to mask the true condition of the paintwork, allowing for accurate assessment once the car is clean and dry. With the car rinsed free of suds, an Aqua Gleam De-ionising Water Filter was connected to the hose to give a final, pure water rinse. 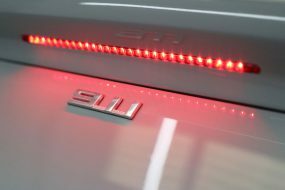 The car was then brought inside the studio and dried using an Ultra-Soft Microfibre Drying Towel. Thoroughly clean, it was now possible to inspect the paintwork to gauge the true extent of the damage which high-intensity lighting showed to be extensive. To correct the paintwork, a RUPES BigFoot LHR 15ES was used with a Flexipads Microfibre Cutting Disc and Menzerna Heavy Cut Compound 400. The refining stage was completed using a FLEX PE14-2 Rotary Machine Polisher with a Flexipads PRO-Detail Hex-Logic Finishing Pad and Menzerna Super Finish Plus 3800. The results were clear to see! 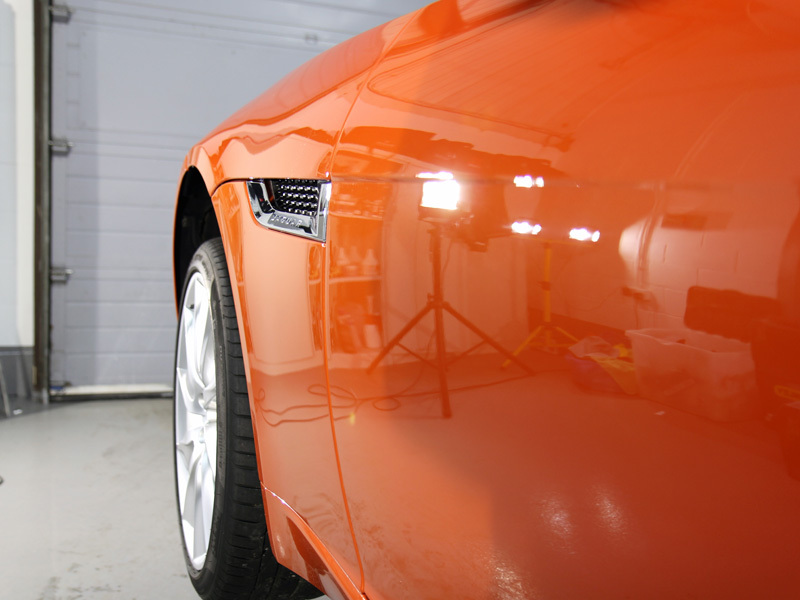 Every part of the Jaguar was cleansed with Gtechniq Panel Wipe to remove polish residues, leaving the surface free of any elements that may interfere with the sealant bonding process. 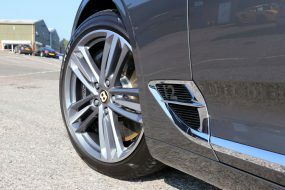 The paintwork and wheels were then coated with Gtechniq Crystal Serum*. This nanotechnology-based sealant is inherently very durable, resilient to pressure swirls that may be introduced through poor washing techniques, and is virtually impervious to harsh chemicals. In order to cure effectively, Crystal Serum must be applied in tightly controlled conditions to ensure performance and longevity. 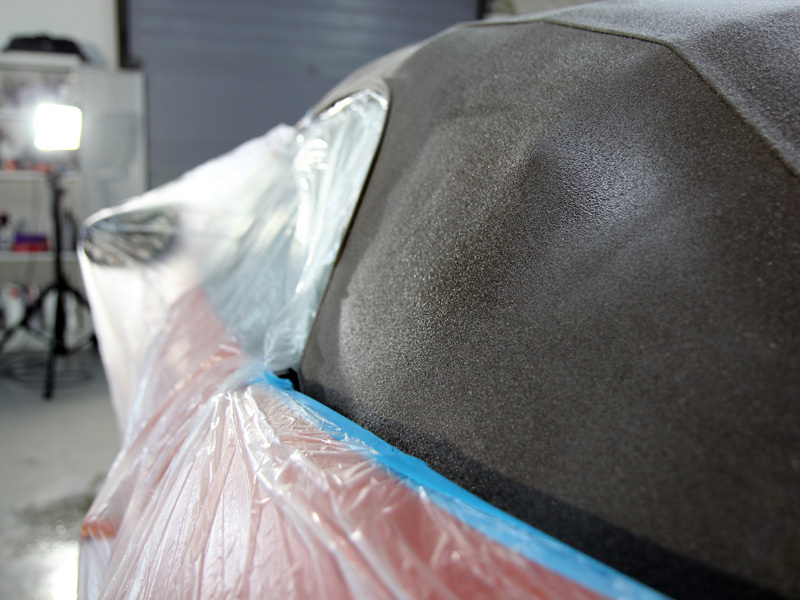 Once cured the finished layer is so hard it requires intensive machine polishing to remove. 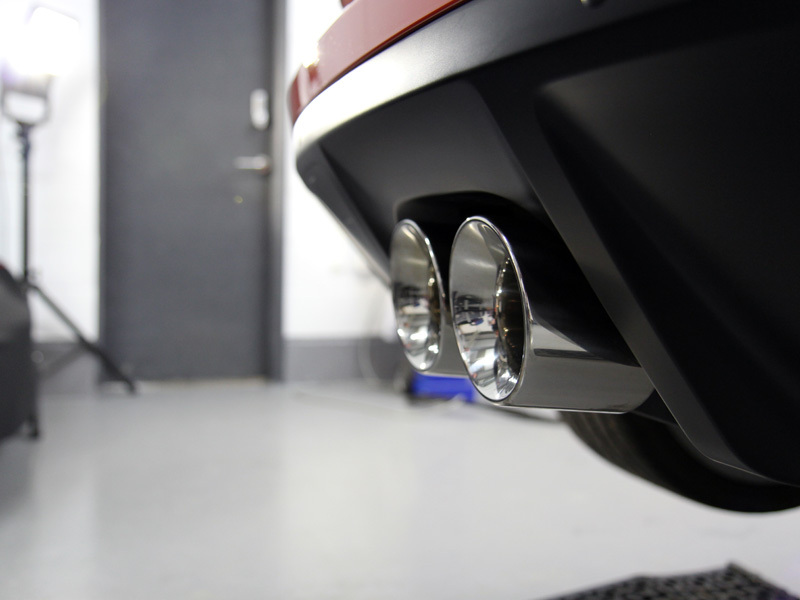 The exhaust tips were polished using Gtechniq M1 All Metal Polish, a chemical cleaner that leaves a lustrous shine. They were then wiped with Panel Wipe before being protected with Crystal Serum. 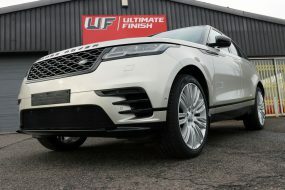 The glass was treated with Gtechniq G1 ClearVision Smart Glass, a hydrophobic sealant that repels water, making driving easier for the driver during bad weather conditions. As a function of the hydrophobic property, snow and ice do not bond as easily to treated glass, making early morning starts much easier during the winter months. With the rest of the car taken care of, attention turned to the fabric convertible roof. The roof was left to dry overnight to ensure it was completely dry prior to sealing. To weatherproof the fabric, Gtechniq I1 SmartFabric was used. This hydrophobic sealant repels rain and, therefore, helps to inhibit the growth of mildew. Attention then turned to the cream leather interior. 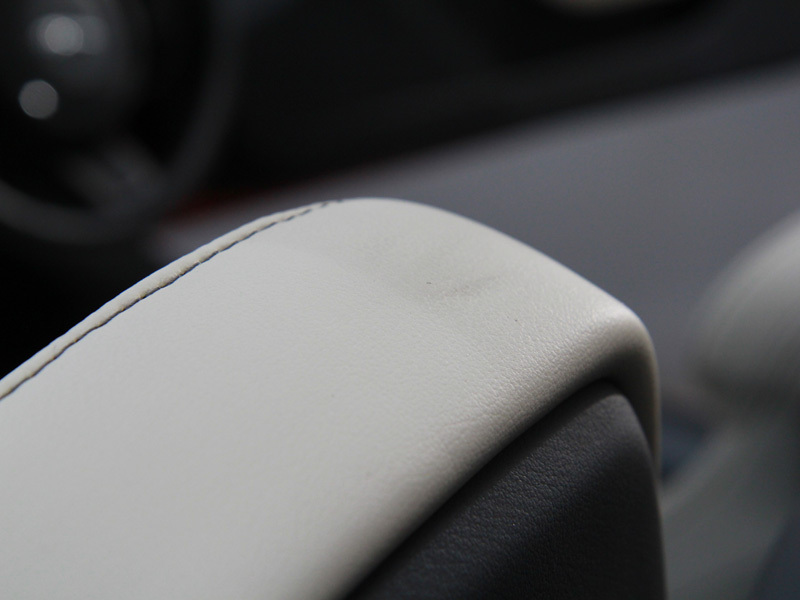 First it was cleaned using Swissvax Leather Cleaner Forte to remove the dirty marks. 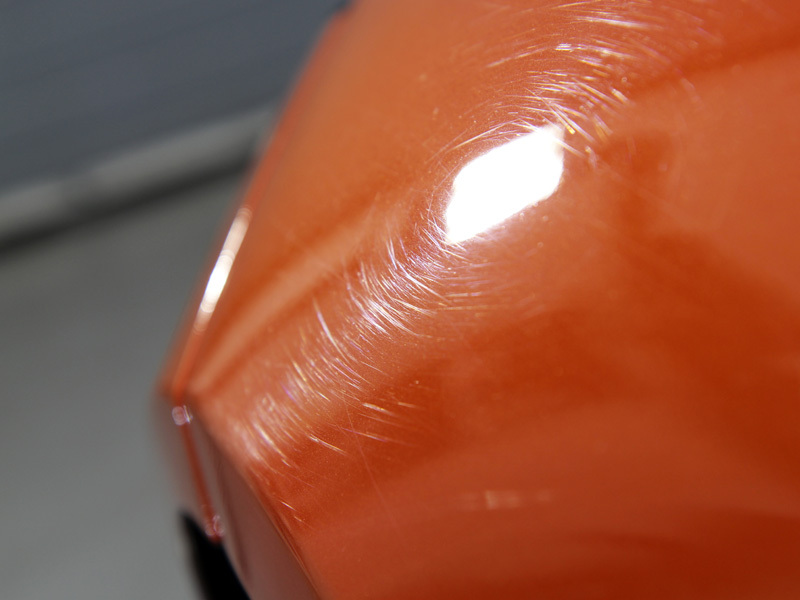 Then the leather was protected with Gtechniq L1 Leather Guard AB. This is another nano-based sealant which coats the leather with an abrasion resistant, non-sticky layer that repels dust and dirt, and helps to prevent dye transfer from darker coloured materials onto the light coloured leather finish. 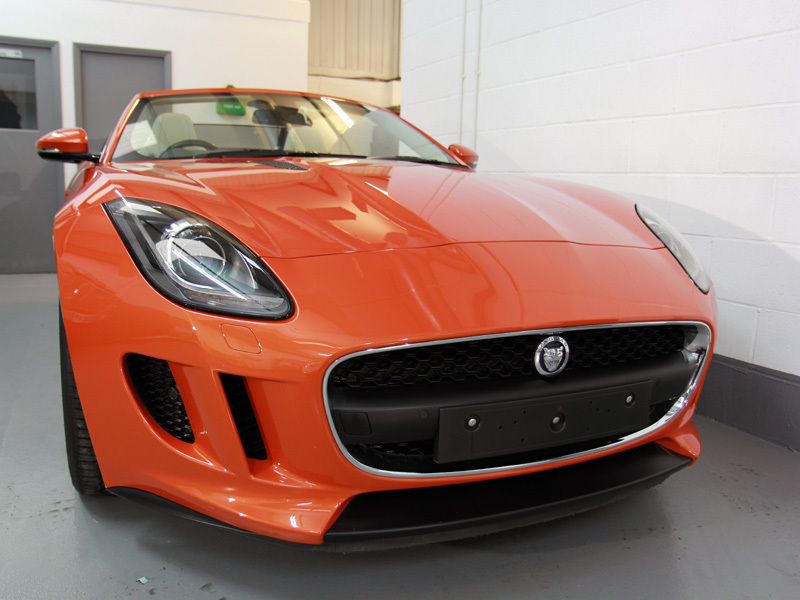 With the paintwork corrected and all the surfaces now protected, the F-Type Jaguar looked better than new! *Gtechniq Crystal Serum must be applied in tightly controlled conditions in order to ensure longevity and performance. 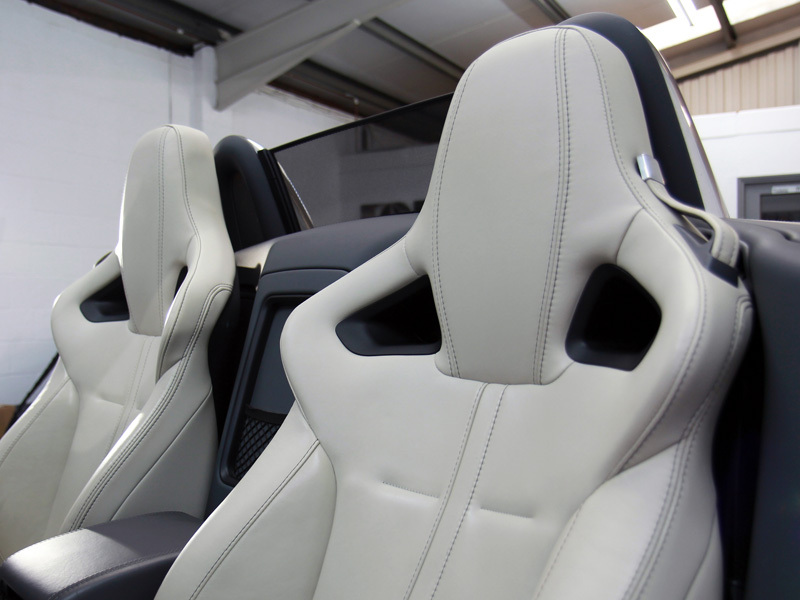 As a result, this product is available as a service only through Gtechniq-approved detailers. Once applied, Gtechniq guarantees the performance for seven years.